Two Greater Toronto area men have been fined a total of $2,000 and received a one-year fishing licence ban for keeping too many sunfish. Deodat Sugrim of Brampton and Mahadeo Sugrim of Etobicoke pleaded guilty to keeping too many sunfish and were each fined $1,000. Both men also pleaded guilty to transporting fish unlawfully taken, and received one-year fishing licence suspensions. Court heard that on May 6, 2014, York Regional Police officers came across the two men angling on the shores of Lake Simcoe. The officers checked both men’s catches and determined they were over the limit of sunfish. 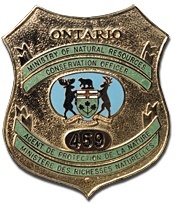 The information was passed on to a conservation officer with the Ministry of Natural Resources and Forestry who followed up with the investigation. The two accused had 134 sunfish, which put them 34 sunfish over their limit of 50 per sport fishing licence. Justice of the Peace Donovan Robinson heard the case in the Ontario Court of Justice, Newmarket, on September 12, 2014.